We have a great sketch challenge for you today, with the Paper Craft Crew! Once again, I was initially stumped as to which stamp set to use with this sketch. Finally, I decided to go with one of the new holiday sets, called Cookie Cutter Christmas. This stamp set alone is so much fun, with a total of 17 photopolymer images to the set, but it’s even more fun when you bundle it with the coordinating Cookie Cutter Builder Punch! It allows you to not only punch out the 5 main images, but also the smaller layering images, too. Once I decided to use the Candy Cane Lane Designer Series Paper, I chose to start with a card base of Real Red cardstock. Next, I cut 2 panels of Crumb Cake, and 2 smaller panels of the DSP to layer on top. I attached those to my card base using Tombow Multipurpose Glue. I stamped the Eskimo image in Soft Suede ink onto Whisper White cardstock, and coloured it using a Blender Pen and inks in Soft Sky, Smoky Slate and Real Red. I added the little ‘blush’ with some Blushing Bride ink and the Blender Pen to the cheeks. After colouring, I used the Cookie Cutter Builder Punch to punch it out. The sentiments, from the Cookie Cutter stamp set, were stamped onto Whisper White cardstock in Real Red ink. 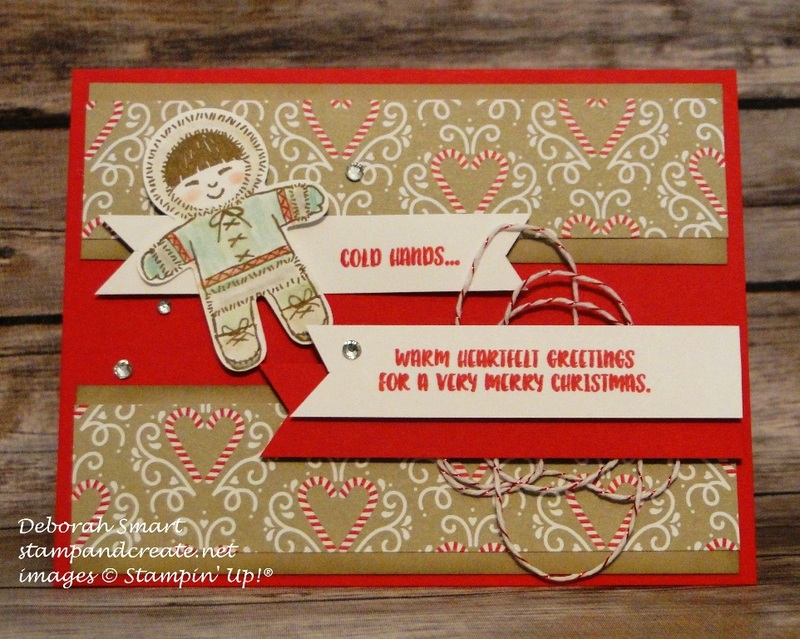 I used the Banner Triple Punch to create the banner tails, and layered the 1st one under the punched eskimo image, and the other on top of another banner of Real Red cardstock. I looped some of the new Candy Cane Lane Baker’s Twine in White with Real Red metallic thread under the sentiment, then added some Rhinestone Basic Jewels to the card front. The new holiday catalogue really has a lot of terrific stamp sets and bundles, not to mention embellishments and papers! I hope you’re having fun using them – or shopping! To see what the rest of the Design Team has created for your inspiration, head over to the Paper Craft Crew challenge blog, then be sure to link up your own card for the challenge. Previous Previous post: Leavin’ on a Jet Plane!